Sandy Springs, GA- Wednesday, April 9, 2014. Mark Spivak escorting Tigger, a Boston Terrier, into the Emory University scanner. To the left is Tigger’s owner Aliza Levenson. In September 2013 the British Broadcasting Corporation (BBC) flew a production crew from London to Atlanta to film a segment for a planned documentary on animal cognition, entitled “Inside Animal Minds.” After obtaining additional footage and completing edit, the final version of the documentary aired in the United Kingdom (UK) on BBC2 on January 28, 2014. The re-edited domestic version will air in the USA on Wednesday, April 9, 16, and 23, 2014 at 9 pm. The April 9 show focuses on birds. The April 16 show focuses on dogs. The April 23 documentary finale focuses on the “smartest” animals. The show will air locally in Atlanta on the PBS affiliate Georgia Public Television (GPTV). The April 16 show on dogs prominently features Sandy Springs dog trainer Mark Spivak and Emory University professor Gregory Berns. Spivak owns Comprehensive Pet Therapy (CPT) in Sandy Springs. Berns is Emory’s Distinguished Chair of Neuroeconomics and Neuropolicy. For the past 2.5 years the two have collaborated on a groundbreaking research project that has achieved notable acclaim throughout the scientific community and amongst pet owners. Spivak and Berns became the first researchers worldwide to effectively use the tool of fMRI to study dog behavior. fMRI stands for Functional Magnetic Resonance Imaging. fMRI examines brain activity over time, which allows for many avenues to non-invasively study the operation of the canine brain. Moreover, since dogs are our most vital pets and the working animal most important to the military, law enforcement, and disabled citizens, understanding how the dog’s brain functions and understanding how to better identify and train working animals and pet animals provides great benefit to government agencies and the community. What makes the technique employed by Berns and Spivak so unique- and noteworthy- is that they do not employ sedation or restraints. Before Spivak and Berns, neuropsychologists and veterinarians believed it was impossible to acquire MRI or fMRI images of animals without the use of sedation or restraints. MRI machines provoke enclosure anxiety in many humans, nonetheless animals that don’t understand the procedure; operate at a piercing 95 decibels or more, which is tantamount to standing near a jackhammer; require virtual motionlessness, as subjects can not move more than 2 mm within any spatial plane for a period of up to 30 seconds; and are constructed for the human anatomy, not the canine anatomy. However, Spivak and Berns wished to humanely use fMRI to study canine cognition, emotions, receptive communication, and sensory perception, so that they could acquire information that would strengthen the human-animal bond. To bring their research and humane objectives to fruition, Berns and Spivak developed a chin rest adaptor and positive-reinforcement based training techniques that taught the animals to cooperatively enter the scanner and remain motionless. 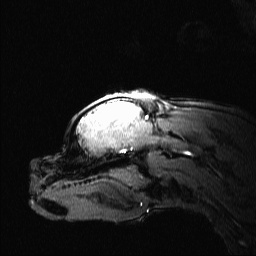 The MRI brain image of Tigger, a Boston Terrier, scanned without the use of sedation or restraints. Although peers worldwide initially scoffed at their vision, they have since successfully scanned 18 community dogs, including Berns’s personal dog, and have published 3 peer-reviewed academic papers that cover the subjects of physical communication, emotions, and social olfaction- and that answer whether our dogs truly love us and who they prefer between their owners or their fellow dogs. In current experiments not yet published, they are developing fMRI models that predict the probability whether a candidate animal will become a successful service dog, determining the comparative value dogs attach to food and social contact, mapping the neural pathways that define familiar and unfamiliar and animate and inanimate visual perception, and mapping the neural pathways involved in canine inhibitory control, which might have important future benefit in developing protocols for alleviating canine anxiety, excitability, and aggression. Spivak and Berns have also founded a company, Dogstar Technologies, that will develop anxiety reduction solutions that originate from the research or that are validated by their fMRI research. The Nova program on April 16 features interviews with Spivak and Berns, shows dogs during live scans, and explains the process, notable research findings, and the benefits of the project. Below is the promotional video for the program available on the PBS Nova You Tube channel. The Dog Project Team is featured from 0:49 to 1:17 on the video. Berns and Spivak wish to expand their canine team to a total of 40 dogs. They invite interested Atlanta dog owners to volunteer. Atlanta area pet owners wishing to participate in the project will need to attend a tryout. If accepted into the program, owners and dogs will then need to attend complimentary bi-weekly training sessions and diligently complete homework exercises. Once their dog reaches proficiency, participants will receive a brain image of their dog, an “MRI Certified” diploma, and compensation for each successful scan. To register for a tryout session, pet owners should contact CPT by phone at 404-236-2150. 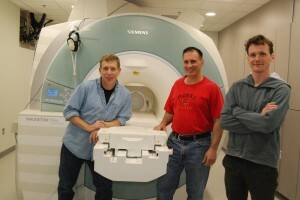 Greg Berns, Mark Spivak, and Peter Cook posing by the Emory MRI scanner.